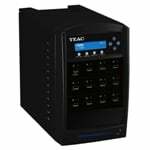 5 drive standalone & automated publishing system to duplicate and print CD and DVD+/-R. Duplicator features 160GB Hard drive, 550 disc capacity and Teac P-55 printer. When Teac first introduced their high end disc printer they wanted a company to build dependable robotics for their units. They turned to R-Quest to manufacture the robotics. 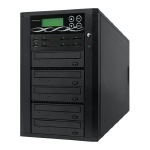 The R-Quest TCP-7550-P55C unit is the first version result of that partnership. 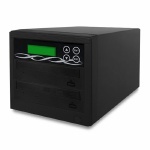 The R-Quest NS2100 and NS4500 units came later for those that wanted a closed case solution for a cleaner look, more security over the physical data, and a closed architecture. 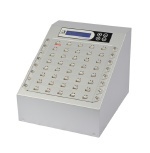 The R-Quest TCP-7550 series holds up to 550 discs on a rotating hopper for unattended operation. 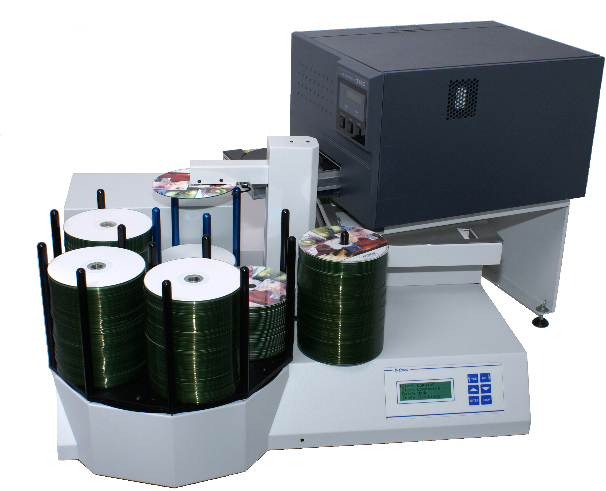 R-Quest has several disc printer options which can be purchased separately or as a bundled set to save even more. The industrial design of the TCP-7550 will give you reliable service without the need for costly repairs. Reliable robotics combined with R Quest’s proprietary board technology, your publishing system will produce only the finest quality copies without the need for constant human intervention! Printing. Duplicating. DVD or CD. Standalone or network. 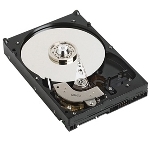 Get the best of all worlds with the new TCP-7550 !